BRUSSELS – Belgium brewers have organised an association, “Unibex” (Union des Brasseries Belges d’Exportation), to push the sale of Belgian beer abroad. They plan to produce a standard beer of controlled density, which will keep well even in the tropics. M. Jean Grofils, President of Unibex, speaking at a luncheon here, said Belgium had lost a large part of the export market abandoned by the Germans and Japanese, because the government had ruled after the liberation that the home market must be supplied first. As a result, he claimed, the thirsty in America and Africa were drinking Dutch beer out of Belgian bottles. M. Grosfils also complained that of 30 commercial agreements which Belgium had signed with other countries since the war, only one – that with England – contained a “drop” of beer. It seems likely Unibex was absorbed into one of the current Belgian beer associations, maybe Belgian Brewers. … Belgian losses in the war were not large. Like England, thickly-peopled, Belgium lives by foreign trade, importing raw materials and food and exporting manufactured goods. Assisted by America in particular, Belgium obtained certain raw materials soon after liberation, which enabled factories to start production. Foreign demand for goods has given Belgium the advantages of a seller’s market. Coal output which affects industrial production at every turn, of course, has been remarkably stepped up by granting special financial and social welfare inducements to Belgian miners and by bringing in foreign workers. Belgium’s own yield of coal is being supplemented by imports from the [German] Ruhr Valley. And the trade of the African Congo colony, much increased during the war, has a significant bearing on the well being of the Belgian motherland. Belgians are aware that the economic health of their country is closely bound up with world conditions. Yet, as the Leader Republican explained, when Belgians contacted likely markets after WW II Dutch beer was already there and doing nicely, especially in the U.S. But even worse, an indignity was being played out in Belgium’s own colony in Africa, the Congo: German brewers were looming, with U.S. money paying for their exports, only three years after the crushing defeat of 1945. How did they do it? The money came from the ERP, or Economic Recovery Program – better known as the Marshall Plan. Under the Plan, which inaugurated in July 1948, the United States made both grants and loans to various European countries, including Belgium. I would think either ERP funds were loaned to African buyers to guarantee payment to the German exporters, or perhaps some money was paid to brewers to help them refurbish and buy supplies. In any case, one can see that Belgium was nonplussed to find its former occupier now facing it in the commercial export arena. (The Belgian Congo is now of course the Democratic Republic of the Congo, which gained independence in 1960). The Unibex plan to export a standard beer of “controlled density” envisaged clearly a Heineken-like product: stable, pasteurized, a blonde lager, one ideally suited warm climates. In fact, Belgium did send such beers overseas in the 1950s. Occasionally in U.S. retailer ads in the 1960s and 70s in the pre-craft era, examples of such beers appear. See for example this list of 1959 in the Times-Union in Albany, which included Ekla, a Belgian lager. Belgian beers, lagers and others, were also reviewed in beer books written by immediate pre-craft authors such as Michael Weiner and Jim Robertson. Yet for some reason the Dutch, and Heineken, captured the American fancy for imported beer in this period. Various German, Canadian, and Mexican beers competed with varying degrees of success, but Belgium was not a player until relatively recently. The purchase of Anheuser-Busch to form Belgian-controlled Anheuser-Busch In Bev in particular gave an impetus to Stella Artois, but the path had been laid by the success of Belgian specialty beers from abbey beers to West Flanders red ales. This 2011 article in the Economist outlined various factors to explain the turnaround of world affections for Belgian beer, including the consolidation impact exemplified by the international expansion of AB In Bev. Yet, it fails to mention the most significant factor (IMO) in this development: the author Michael Jackson via a number of his books but none more important than The World Guide to Beer in 1977. The deftly-written essays and evocative photography delineating a hitherto unknown Belgian beer ethos created an avidity to know and understand these beers. Soon Jackson inspired other writers who broadened the message he first delivered. Beers that were sourish to the taste were henceforth prized as gastronomic specialties, whereas in the 19th century, most visitors dismissed them as retrograde and anchored in primitive practices. Of numerous examples to cite, this one, from English writer W. Beatty-Kingston in 1890, will suffice. Before Jackson, there was a scattering of articles in the U.S. press and some recognition in a couple of beer books that Belgium had a beer culture of note. See one press example here from 1964 in Camden, NY. Yet, nothing that would have blossomed into the vibrant reputation Belgium enjoys today where 70% its production is exported and adds considerably to the national balance of payments. Lisa Bradshaw reviewed the recent data in Flanders Today. Unibex would have swooned to have that result. M. Grosfils would have found it curious too that initial success was based, not on a standard lager, but local, half-disappeared styles such as Trappist beers, lambics, Wits, and other exotica as distant from the Unibex “silver bullet” as one could imagine. Arguably today Belgium has trumped those other countries’ reputations internationally for beer quality and interest, even Germany. Germany today is perhaps, in beer terms, the Belgium of 1948! It proves what I’ve said many times: in Shelley’s famous phrase, “poets are the unacknowledged legislators of the world”. Not just “poets” whose courage and imagination excite and change taste, but voices “unacknowledged” for their gift to humanity in the fullest sense. Of course, Jackson was acknowledged by his peers and followers, was indeed a star in his lifetime, but I am speaking in relative terms. By 2011, the Economist could write the article it did and leave him out. Not that one can blame them really, times change, culture is altered permanently, people forget or never knew how it started. Unibex had the right idea in 1948, but had challenges from experienced international businesspeople based in Amsterdam, Rotterdam, Bremen, Munich, and Copenhagen. It needed a poet to sing the soul of beer. He or she wasn’t in purview in 1948 when the imaginative and luminous of temperament were second fiddle to practical plans to restore a functioning world order. But the saviour did finally come, in the form of Michael Jackson (1942-2007), and that is why in 1994 the Belgian state awarded to Jackson its Mercurius award for service to Belgian brewing. No less than a Crown Prince, Philippe of Belgium, now its King, presented the honour to him. 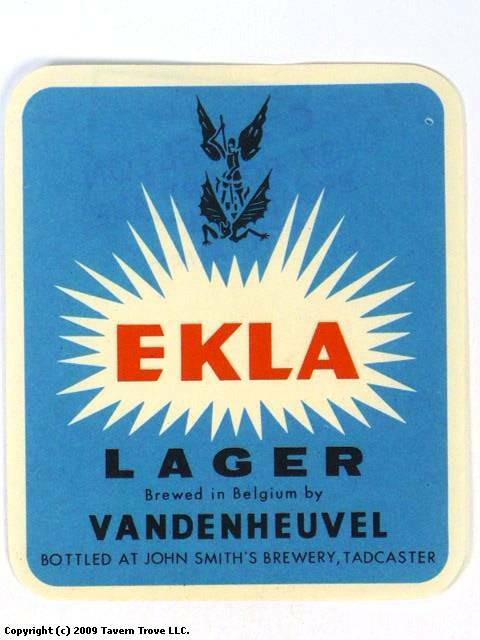 Note re images and quotations: The image above of an Ekla coaster was sourced from the Tavern Trove breweriana site, here. Image and quotations are used for educational and historical purposes, and for fair comment. All intellectual property therein belongs solely to the lawful owners, as applicable. All feedback welcomed.